What is the Price Guide Browser? The Price Guide Browser is a prepackaged application ready to use on your computer. The browser contains all the embossing and color listings and CD drawings in the paper edition of the North American Glass Insulators: Identification, Reference, & Price Guide by Donald R. Briel, but with an easy to use graphical interface. With a few mouse clicks you can look up any insulator and find its price in seconds! It's so easy to use that even the most novice computer user will have no trouble using it. 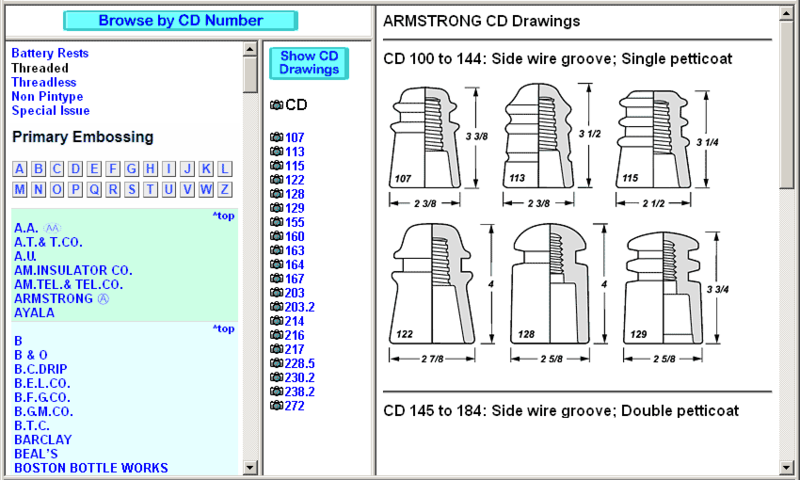 If you don't know the CD number, you can view CD drawings to help you select the correct CD. Easy to use. No internet connection required. Simple "point and click"
By default this is the way the Price Guide Browser starts up. The first pane lists CD numbers. You click on the CD you are looking up, and in the second pane, only those Primary Embossings that are valid for that CD appear. IN addition, the CD drawing for that CD appears in pane three so you can verify you have selected the correct CD number. You click on the desired Primary Embossing in pane two, and all the embossings, colors and prices for that combination are shown in pane three. 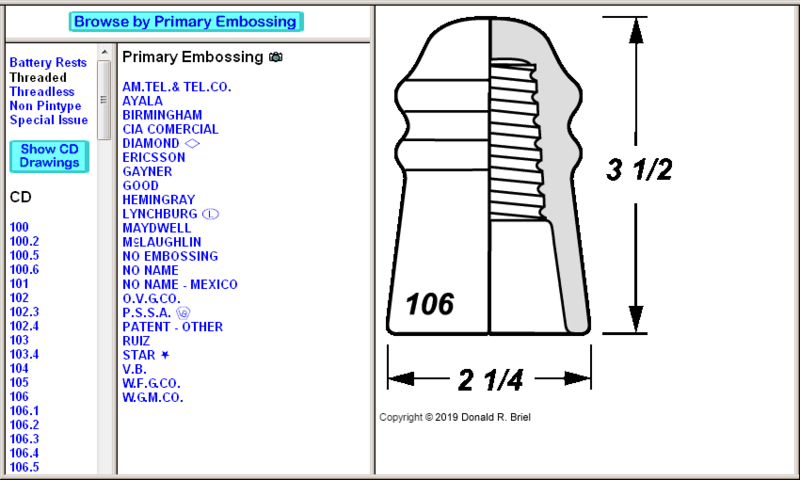 This "CD and Primary Embossing" layout is typical of how we look up insulators today. A view of this is shown below. Notice the CD listings in the first pane, and the Primary Embossing listings in the second pane. 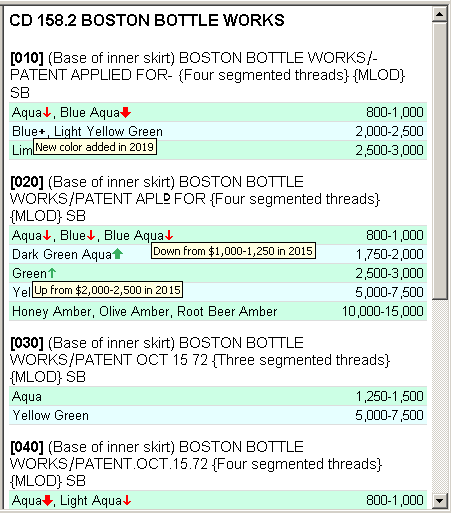 Note that for easy reading, colors that are listed for the same price are grouped in blue and green pastel bands. Now select a Primary Embossing by clicking on the Primary Embossing in the middle pane. There is a second, perhaps more powerful, way to look up your insulators. Often, you are more familiar with what the Primary Embossing of your piece is, rather than knowing the specific CD first. With the Price Guide Browser you can look up your insulators this way. The first two panes (CD and Primary Embossing) can be flipped with a click of the mouse on the "Browse by Primary Embossing" button. In this mode, you click on a Primary Embossing in pane one, and only the CD's that are valid for that Primary Embossing appear in pane two. In addition, all the CD drawings for those corresponding CD's are shown. You click on the desired CD number in pane two or the CD drawing in pane three, and all the embossings, colors and prices for that combination are shown in pane three. For instance, you have an Armstrong insulator you wish to look up. 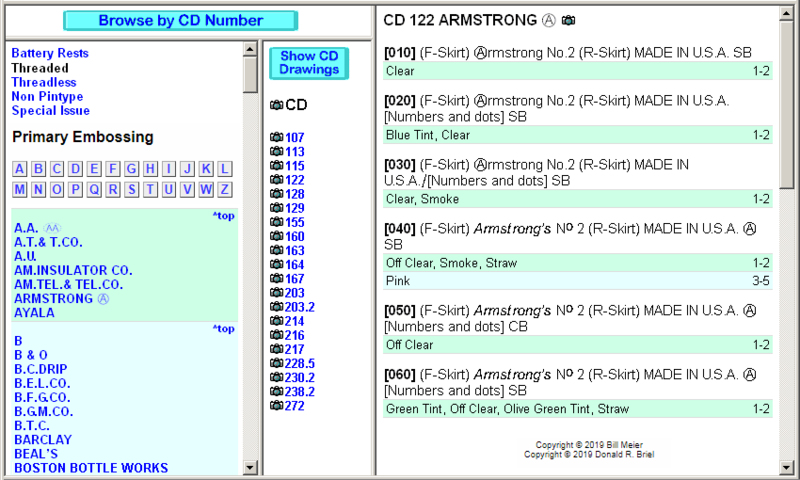 You select that Primary Embossing in the first pane, and all the valid CD's for Armstrong are listed in the second pane. In this case there are twenty CD's. It is probably much easier to pick out which of those twenty CD's match your insulator. The examples below shows the selection of Primary Embossing Armstrong in the first pane; the valid CD's for that embossing in the second pane, and the specific embossings, colors and prices in the third pane. 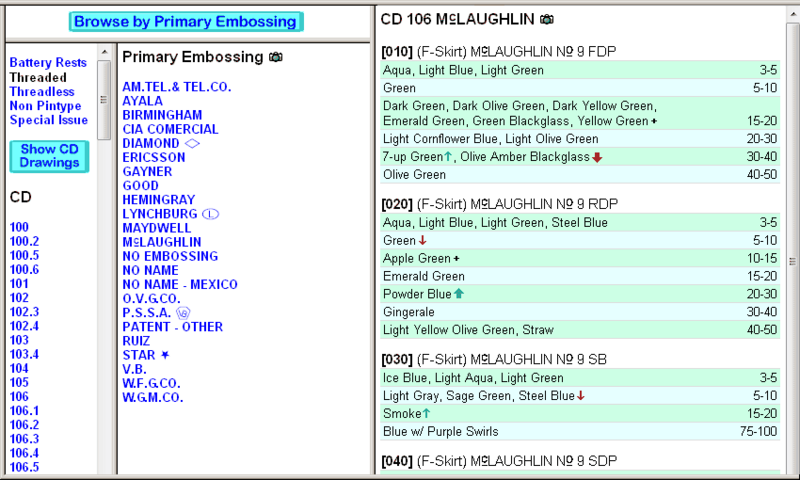 Primary Embossings that start with the same letter are grouped in alternating pastel bands for easy viewing and selection. You can easily switch back to method one by clicking on the "Browse by CD Number" button. Now select a CD number either from clicking on the CD number in the middle pane or by clicking on the corresponding CD drawing in the right pane. The Price Guide Browser allows you to easily switch between the major CD classes: Battery Rests, Threaded Pintypes, Threadless Pintypes, Non Pintype (Blocks, Spools and Miscellaneous Styles) and Special Issue (Commemoratives, Private Issue, etc.). In the example above, you can see these classes in the upper left. The CD class in black is the class you are currently browsing. With a single click on one of the other names that are in blue you can switch to that CD class. Included is a feature that gives you information about price changes from the previous guide and flags new color listings. If you hover your mouse over the color name that has one of these icons next to it, you will get a popup message (the box with a light yellow background) with more information as shown in the example above. What is the Insulator Arial Font? Included with the Price Guide Browser, is the custom designed Insulator Arial True Type Font (currently available on Windows only). This is the font that was used to generate the special characters in the hard copy Price Guide. This font is used in the Price Guide Browser as well, so all the special symbols, raised letters, backwards digits, etc. can be shown accurately on your screen. Over 80 special characters are included. The example below highlights some of their usage. You can use this font in any application that allows you to set a font for an item. Word processors, spreadsheets, database applications and more. As easily as you can select "Arial" or "Times New Roman" or your other favorite font, you can select "Insulator Arial" and be able to include all these special symbols. The font is fully compatible with all Windows software and printers; you don't need anything extra. You can catalog your insulators with the exact representation of the embossing as you have seen in the hard copy Price Guide. Some people said that having this font alone is worth the purchase price of the whole package! This is Great! How do I Order it? The prerequisite for purchase of the Price Guide Browser is that you purchase the paper edition of the North American Glass Insulators: Identification, Reference, & Price Guide. For ease of ordering, you can purchase them together. Just visit www.InsulatorPriceGuide.com. I hope you enjoy this product and find it as useful as I have. Please feel free to contact me with any questions you have.